6. vSAN could then be enabled.To accomplish these tasks, vCenter had to already be installed somewhere. In environments where vCenter (Windows or VCSA) already existed, it was not difficult. In “greenfield” deployments it was a bit more challenging. 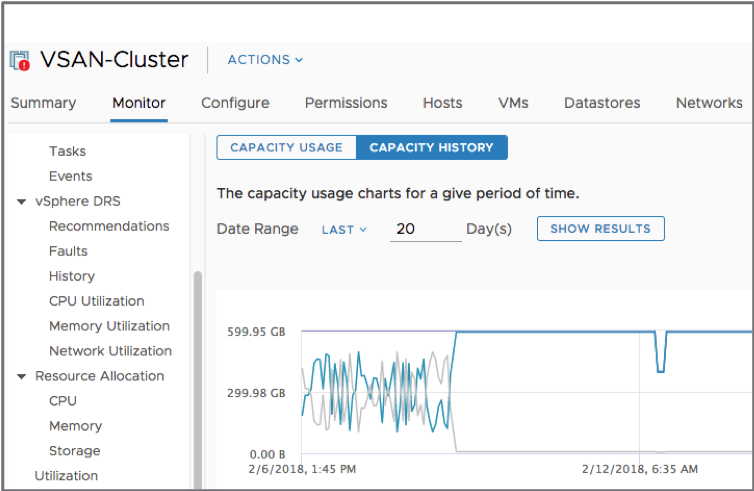 There were a couple methods for “bootstrapping” a VCSA to accomplish this task of getting vCenter running on top of the vSAN datastore it was managing. Before Easy Install, there were a couple mechanisms to bootstrap the VCSA onto a vSAN installation. This process isn’t complicated, but is a bit transient. The transfer or swing datastore only serves the purpose of allowing the VCSA to be configured and then ultimately moved to the vSAN datastore. William Lam posted this method on virtuallyghetto.com in 2013. Install ESXi 6.x on physical hosts. The VCSA installer can be used to deploy the VCSA to the first host with the manually created vsanDatastore. Once the VCSA has been deployed, a Datacenter has to be created, a Cluster (with vSAN enabled) and the first host added. As can be easily seen, the manual method it a bit more complex. William Lam posted this method on virtuallyghetto.com in 2013. Easy Install takes the effort out of installing the VCSA on a standalone host and enabling vSAN for a larger deployment. With the introduction of vSAN 6.6, installation of the VCSA to a brand new, “greenfield” vSAN cluster is very simple using the Easy Install method. The Easy Install method is only available when connecting the VCSA installer to an ESXi host that has vSAN 6.6 preinstalled. Hosts that have previous builds of ESXi will not be presented the option of creating a vSAN datastore. When presented with the “Select datastore” wizard, “Install on a new vSAN cluster containing the target host” is an alternate option to installing on an existing datastore. VMware vSAN is the market leader in HCI. One of the many driving forces that has helped solidify this position, is the rapid and continuous pace of innovation. VMware has always given customers the power of choice, and this continues into the hybrid cloud era. VMware’s digital foundation gives customers the ability, and flexibility to build true hybrid cloud environments to best suite their use cases. VMware offers a full stack SDDC, and HCI is the starting point for those transitioning to a software-defined infrastructure. Data centers powered by VMware vSAN offer scalability, flexibility, and manageability to meet nearly any demand, and is the cornerstone for customers looking to build private clouds and extend their multi-cloud capabilities. VMware vSAN is the only storage software natively integrated with the market-leading hypervisor, vSphere. This unique integration delivers optimal resource utilization for the most critical of applications. VMware vSAN provides industry-leading deployment flexibility with the largest HCI ecosystem. Over 15,000 private clouds, running on over 500+ ReadyNodes™, jointly certified servers, VxRail – a jointly engineered turnkey appliance, as well as two of the largest public cloud providers, Amazon and IBM. Run HCI on the hardware you prefer. VMware uniquely provides centralized management of all your HCI deployments from edge to core to cloud from the same tools you use today, vCenter and vRealize . These can optimize your operational efficiency with a single toolset across the hybrid cloud, without having to learn any new skills. All of these features are available today. Not tomorrow, not next quarter, not next year, today. Only VMware can deliver a true hybrid cloud to your data center now. 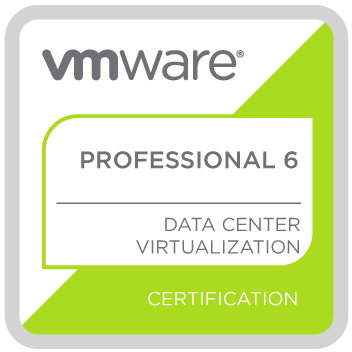 VMware vSAN 6.7 U1 makes it even easier to adopt HCI and build a Digital Foundation. Key areas where vSAN 6.7 U1 provides additional benefits include the simplification of day one and two operations, lowering the total cost of ownership with more efficient infrastructure, and even more rapid support and resolution with ReadyCare. First, we are simplifying operations day one and two operations by streamlining the deployment process, improving lifecycle management, reducing disruptions during maintenance operations, and improving capacity reporting. These updates help administrators more quickly and easily deploy and extend infrastructure while minimizing disruptions while keeping the environment up to date. Speed to market and configuration consistency are paramount to reduce risk, maintain uniformity, and achieve better stability and efficiency. 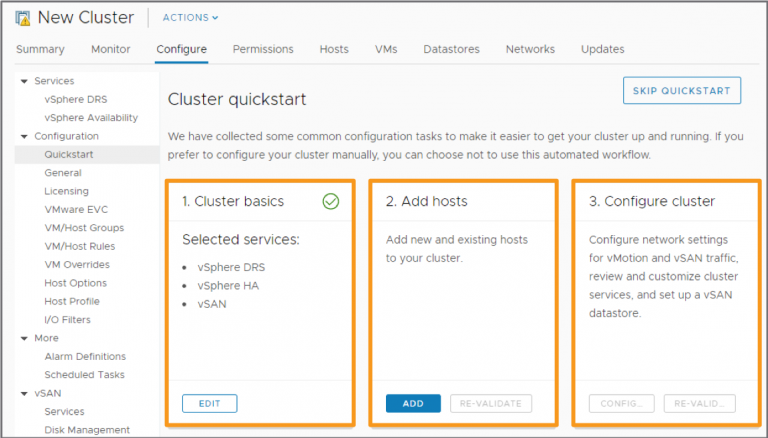 A new “Quickstart” guided cluster creation wizard gives administrators a streamlined mechanism for deploying vSAN, and non-vSAN, clusters. 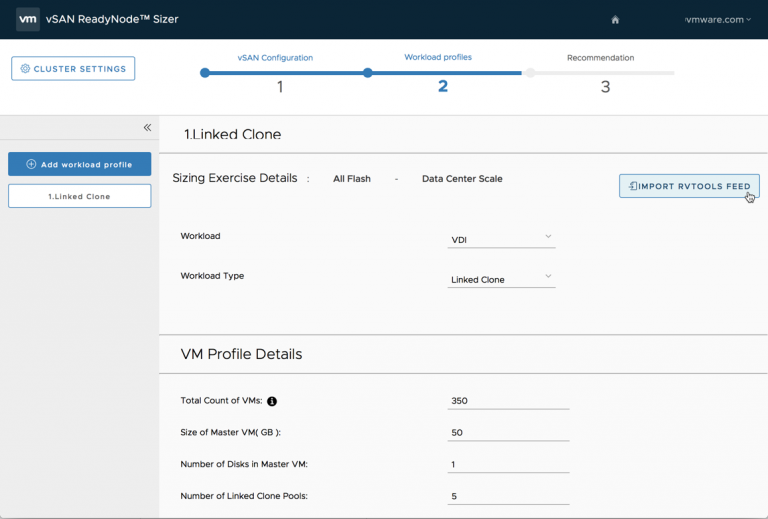 An easy to use, step-by-step configuration wizard makes creating a production-ready vSAN cluster effortless. Cluster Quickstart handles initial deployment, as well as the process of expanding the cluster as needs change. The Cluster Quickstart wizard works great for configuring vSAN clusters added to an existing vCenter 6.7 U1 deployment, as well as a great next step after using vSAN Easy Install to bootstrap a new vCenter onto the first host in a new vSAN cluster. The Cluster Quickstart wizard can be seen in action on StorageHub. 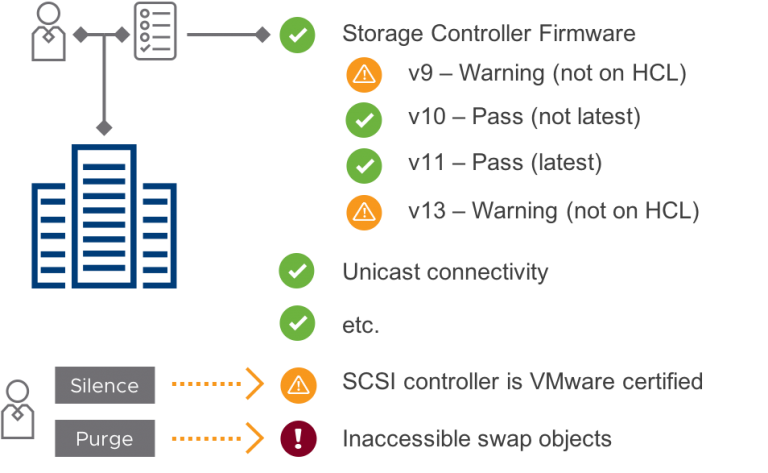 Updated in vSAN 6.7 U1, all ESXi, driver, and firmware update functions previously handled by the Configuration Assist workflow have been moved to vSphere Update Manager. Specific OEM builds can be supported in vSphere Update Manager for 6.7 U1 because it will support the use of OEM vendor ISOs. For those needing to update environments that do not have Internet connectivity, new workflows provide guidance for adding updates to the network isolated environment. Since each vSAN host in a cluster contributes to the cluster storage capacity, entering a host into maintenance mode takes on an additional set of tasks when compared to a traditional architecture. vSAN 6.7 U1 has improved the safeguards when performing maintenance and decommissioning activities on vSAN hosts. vSAN will now perform a full simulation of data movement to determine if the process of entering maintenance mode will succeed or fail before it even starts. This will prevent unnecessary data movement and provide a result more quickly to the administrator. New warnings have been added to entering maintenance mode activities to ensure that there are no other hosts already in maintenance mode or resync activity current performing. For cases where an administrator needs to adjust the time vSAN waits before it begins to rebuild data to reestablish compliance with storage policies, a new “object repair timer delay” setting is now in the UI. All of these improvements are added to enhance the overall experience and predictability of host decommissioning activities like entering a host into maintenance mode. In vSAN 6.7, “vRealize Operations within vCenter” provided an easy way for customers to see basic vRealize intelligence with vCenter. 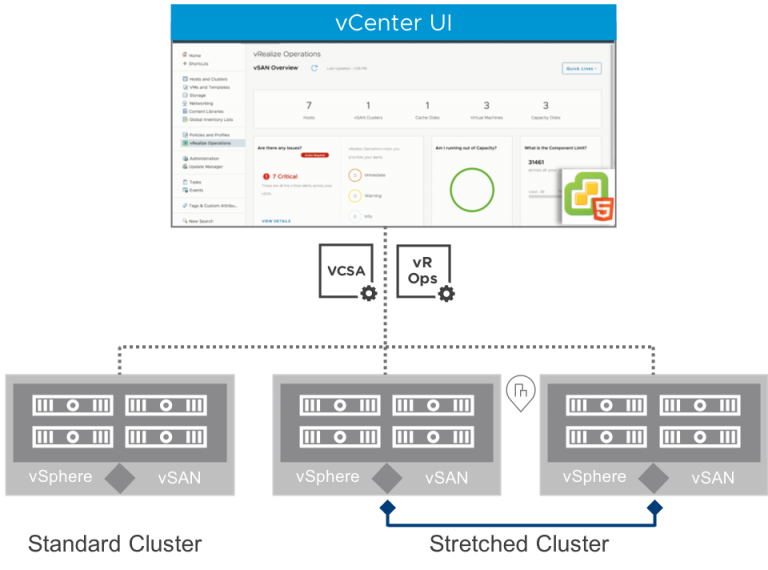 New in vSAN 6.7 U1, vRealize Operations dashboards have the ability to differentiate between normal and stretched vSAN clusters, displaying appropriate intelligence for each. An incredible number of metrics are exposed to assist with monitoring and issue remediation. vRealize Operations makes it easier to correlate data from multiple sources to speed troubleshooting and root cause analysis. vSAN 6.7 U1 enhances capacity reporting in a few different ways. Having a better understanding of past, present, and future capacity utilization is a top-of-mind concern for administrators. 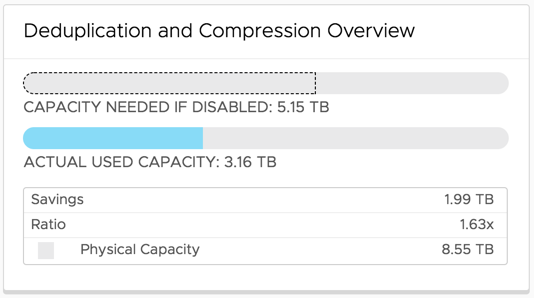 See the amount of capacity used historically in vSAN 6.7 U1, including changes in deduplication & compression ratios over time. Next, vSAN is an even more efficient infrastructure choice. More efficient infrastructure helps in lowering the total cost of ownership. Space reclamation, enhanced networking support for some architectures, as well as better sizing tools lead to even more efficiencies with vSAN. Popular workloads can use less storage through the process of automatic space reclamation. The addition of TRIM/UNMAP support can automatically reclaim capacity that is no longer used, reduces the capacity needed for popular workloads without administrator interaction. TRIM/UNMAP will be supported in a variety of Guest Operating Systems, virtual hardware configurations, and virtual machine configurations. 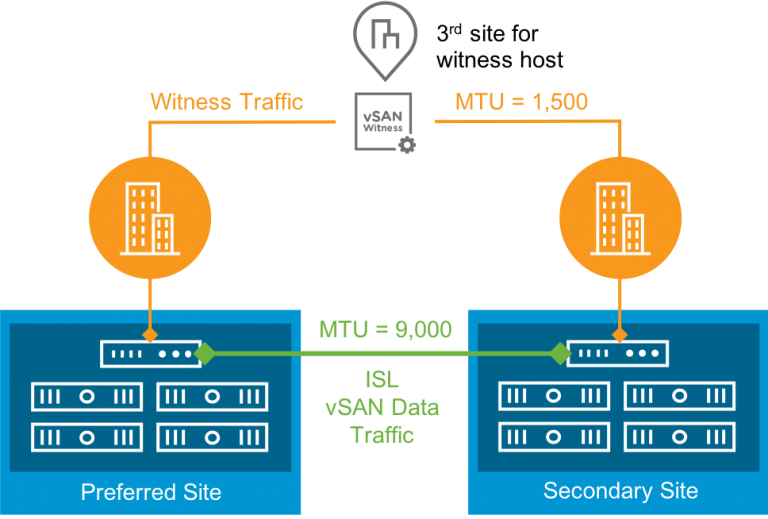 In a stretched cluster environment, the ability to isolate witness traffic using dedicated uplinks was a powerful enhancement made to vSAN 6.7. vSAN 6.7 U1 introduces additional levels of flexibility to this feature with the support of mixed MTU sizes configured for witness traffic, and the Inter-site link used for vSAN data traffic. This allows for a user to configure vSAN to use perhaps larger frame sizes on the vSAN data network while keeping the witness uplinks going to the more affordable witness site to a more common standard MTU size. This enhancement will give additional flexibility in accommodating a wider variety of customer topology conditions and reduce potential network issues. We’re also introducing new capabilities that simplify planning to help customers size the most efficient deployment for their environment. 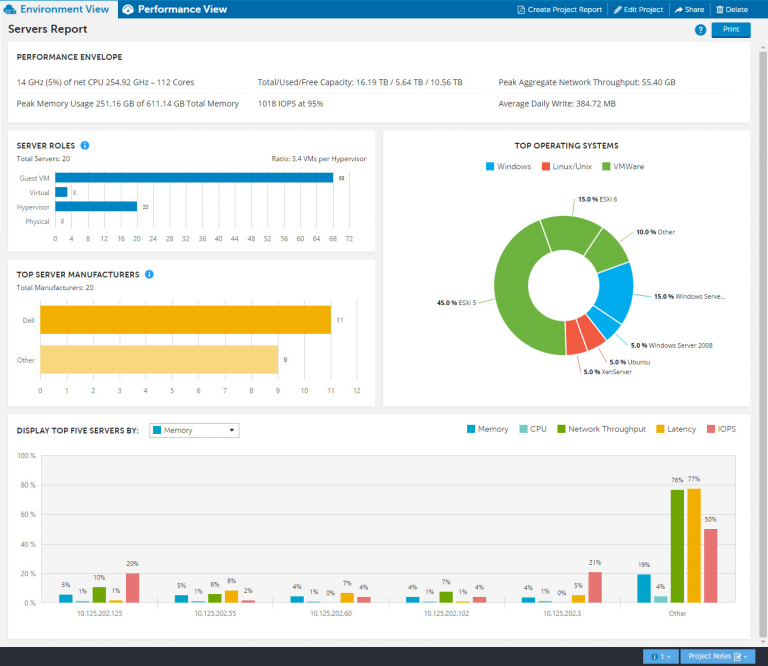 Updates to the HCI Assessment and vSAN Sizer tools work even better together to provide a more streamlined and flexible sizing and infrastructure selection process to ensure the most efficient configuration for new deployments. Faster resolution, quicker diagnosis, and simplified self-help make vSAN Supportability even better. vSAN ReadyCare has simplified the support process by reducing requirements of customers, and speeding time to resolution through faster insight and integrated self-help in vSAN. The health check feature of vSAN continues to play a prominent role in its ability to ensure that an environment meets hardware and software configuration requirements.vSAN 6.7 U1 extends this feature even more, with a more robust way of handling multiple approved firmware levels for storage controllers. 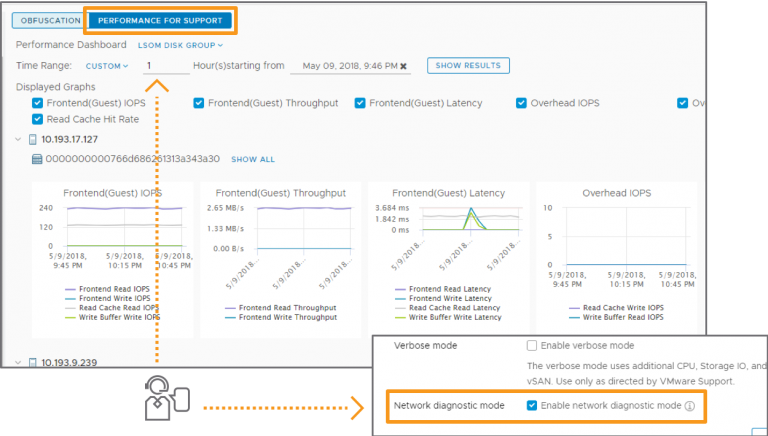 A new Unicast network performance health check and test ensures that proper continuity is achieved between vSAN hosts and will report network bandwidth results for the tests.vSAN 6.7 U1 also introduces functionality that is now accessible in the UI. Health checks can be silenced granularly, directly in the UI, as well as being able to purge inaccessible swap objects that are no longer needed.These improvements improve the effectiveness of vSAN’s ability to not only recognize issues but remediate them more quickly. vSAN 6.6.1 introduced “vSAN Support Insight,” VMware’s method of automatically collecting vital infrastructure telemetry data about an environment for the VMware technical support engineers in our global support services group. vSAN 6.7 U1 continues with these improvements, introducing fine-grained, deep level performance graphs for the explicit purpose of issue resolution. GSS engineers will have new tools for capturing critical network diagnostic data. These advances help reduce the need to request log support bundles from the hosts, and when they are absolutely necessary, will contain even more critical data for better root cause analysis. Native health checks, more self-help tools, better reactive support with vSAN Support Insight, and participation in the VMware Customer Experience Improvement program, provide for an overall enhanced support experience. VMware can rapidly understand a customer’s environment, perform root cause analysis to identify the cause of the problem, and deliver proactive support based on trends and analytics. VMware vSAN continues to innovate at a rapid pace, making it even easier to adopt HCI and build a Digital Foundation. Simplified operations, a lower cost of ownership, and even more rapid support and resolution are just a few of the key areas that help make VMware HCI with vSAN the industry-leading HCI provider. Whether on-premises or in the cloud, only VMware can deliver a true hybrid cloud to your data center now. Jase McCarty has a diverse career in technology over the past 25 years. As an IT pro, he has worked in academics, health insurance, & financials in positions ranging from administration, architecture, web development, curriculum development, to training. Before coming to VMware, he was a vSpecialist at EMC, supporting the Federal Government. He is a retired USAF MSgt, where he spent most of his military career in Communications. He is Co-Author of two virtualization books, is regularly designated as a vExpert, and is active on Twitter as @jasemccarty. vSAN 6.7 introduces a number of key features that help us provide an HCI solution for customers that want to evolve without risk, lower their TCO, and accommodate the demands of IT environments for today, tomorrow, and beyond. To help customers evolve their data center with HCI, the improvements of vSAN 6.7 focused on enabling customers to improve their experience in three key areas: Intuitive Operations Experience, Consistent Application Experience, and Enhanced Support Experience. 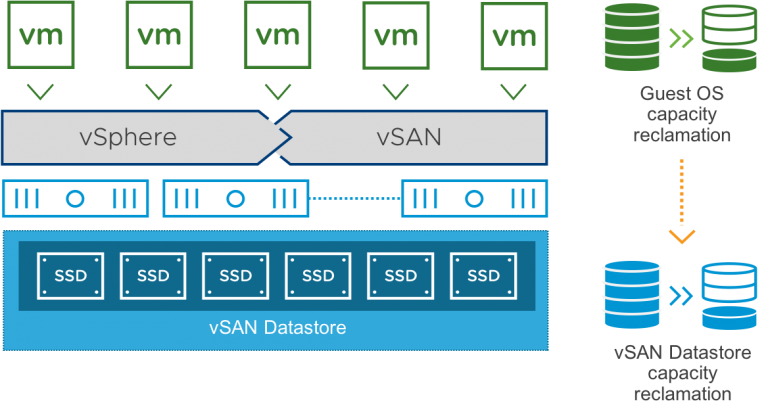 This video introduces VMware’s Software Designed Enterprise Class Storage Solution vSAN. vSAN powers industry-leading Hyper-Converged Infrastructure solutions with a vSphere-native, high-performance architecture. NOTE: This video is roughly 30 minutes in length so it would be worth blocking out some time to watch it! We would like to remind you that the End of General Support (EOGS) for vSphere 5.5 and vSAN 5.5 is September 19, 2018. To maintain your full level of Support and Subscription Services, VMware recommends upgrading to vSphere 6.5 or 6.7. Note that by upgrading to vSphere 6.5 or 6.7 you not only get all the latest capabilities of vSphere but also the latest vSAN release and capabilities. vCloud Suite 5 and vSphere with Operations Management (vSOM) customers running vSphere 5.5 are also recommended to upgrade to vSphere 6.5 or 6.7. 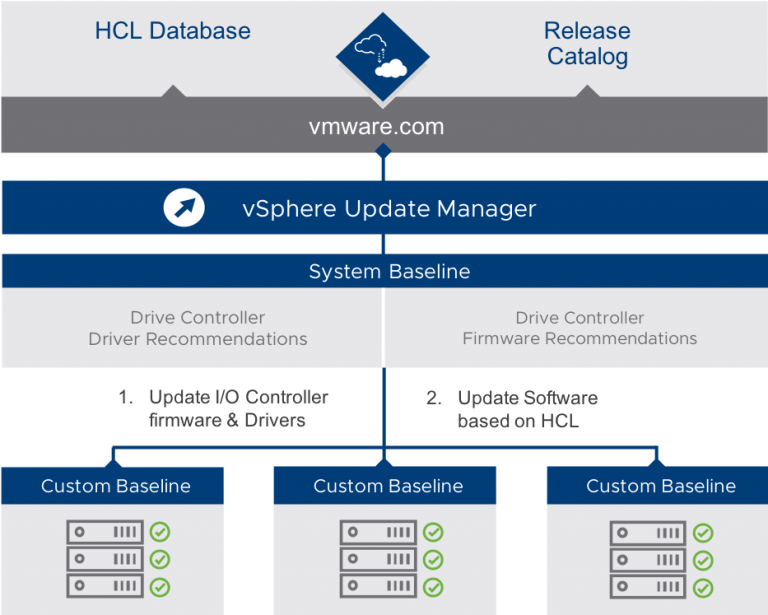 For more information on the benefits of upgrading and how to upgrade, visit the VMware vSphere Upgrade Center. For detailed technical guidance, visit vSphere Central and the vSphere 6.5 Topology and Upgrade Planning Tool. VMware has extended general support for vSphere 6.5 to a full five years from date of release, which will end on November 15, 2021. This same date applies to vSphere 6.7 end of general support as well. If you require assistance upgrading to a newer version of vSphere, VMware’s vSphere Upgrade Service is available. This service delivers a comprehensive guide to upgrading your virtual infrastructure including recommendations for planning and testing the upgrade, the actual upgrade itself, validation guidance, and rollback procedures. 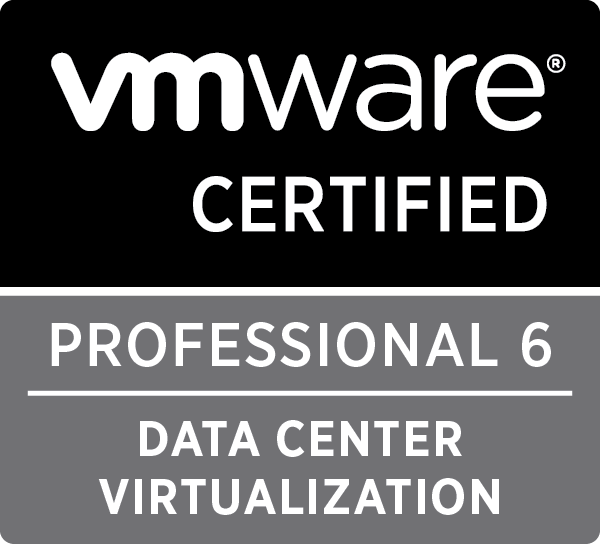 For more information, contact your VMware account team, VMware Partner, or visit VMware Professional Services. If you are unable to upgrade from vSphere 5.5 before EOGS and are active on Support and Subscription Services, you may purchase Extended Support in one-year increments for up to two years beyond the EOGS date. Visit VMware Extended Support for more information. This bundle of vSphere and vRealize Operations allows you to upgrade the versions of individual components independent of each other. If you are using vSphere 5.5 as part of vSOM, you will need to upgrade your vSphere with Operations Management 5.5 license key, to be able to upgrade the vSphere component. You can reference the VMware Lifecycle Product Matrix to check for the EOGS date for the version of vRealize Operations you are using and the VMware Product Interoperability Matrices for the product version compatibility. This bundle of vSphere and VMware’s management products will also require an upgrade of your license key to vCloud Suite 7 or later. Upgrading to vCloud Suite 2017 is encouraged to leverage the vRealize Suite 2017 multi-vendor hybrid cloud management platform. You can reference the VMware Lifecycle Product Matrix to check the EOGS date for each version of the products in the bundle and the VMware Product Interoperability Matrices for the product version compatibility. This product is embedded in the vSphere 5.5 kernel and by upgrading vSphere you will also upgrade vSAN to a newer release. You will need to upgrade your vSAN 5.5 license key to a newer release license key. Please confirm hardware compatibility by referencing the vSAN Compatibility Guide and if necessary, make appropriate hardware upgrades as needed to maintain compatibility. If you are using vSphere 5.5 or vCloud Suite 5, please contact your VMware account team or a VMware Partner with any questions and to begin an upgrade plan. Himanshu Singh is Group Manager of Product Marketing for VMware’s Cloud Platform business. His extensive past experience in the technology industry includes driving cloud management solutions at VMware, growing the Azure public cloud business at Microsoft, as well as delivering and managing private clouds for large enterprise customers at IBM. Himanshu has been a frequent speaker at VMworld, Dell Technologies World, vForum, VMUG, Microsoft TechEd, and other industry conferences. He holds a B.Eng. (Hons.) degree from Nanyang Technological University, Singapore, and an MBA from Tuck School of Business at Dartmouth College. Follow him on twitter as @himanshuks. This session covers basic to advance vSAN topic. Watch this video if you to learn basics and few of the advance areas of vSAN. Join me and my special guest Steve Tuomey to discuss the VSAN 6.2 architecture, including hybrid and all flash utilization. This video shows you how to create or modify a Virtual SAN storage policy, how to assign a policy to VMs and other objects, and how to check policy compliance. vSAN 6.2 Named Software-Defined Technology Category Winner For The CRN 2016 Product of the Year Award! The Storage and Availability solutions team is excited to announce that vSAN 6.2 was named the overall winner in the Software-Defined Technology category for the CRN 2016 Products of the Year Awards! We are extremely humbled by this recognition and couldn’t be more proud of the team. 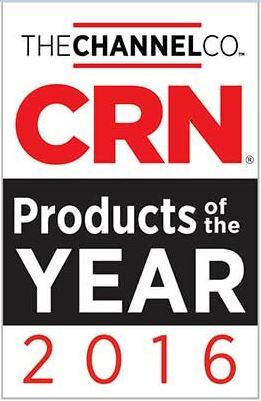 CRN’s annual Products of the Year Awards are given to standout products and services that represent best-in-breed technological innovation backed by a supportive channel partner program. For the first time, CRN did the judging a little differently. CRN editors selected five finalists among 17 technology categories and then asked solution providers to rate the products to determine a winner based on the subcategories of Technology, Revenue and Profit, and Customer Demand. The finalists and winners were originally selected from a survey that netted more than 5,000 responses. This captured real-world satisfaction among customers and partners. vSAN 6.2 introduced key space efficiency features like deduplication, compression and erasure coding including Quality of Service (QoS) and Software Checksum. 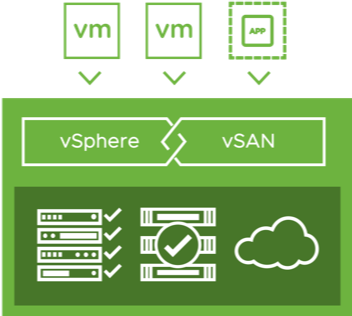 With vSAN’s fast pace of innovation, the storage and Availability Solutions team introduced vSAN 6.5 which GA’d on November 15, 2016 and introduced features like: 2-node direct connect which could save customers up to 20% per ROBO site, full-featured PowerCLI for scalability and ease of enterprise-class automation and support for next-gen hardware including large capacity drives with 512e support.